There are some recipes I cook, nail, and share with you as soon as I can. Other times I work at a recipe week after week until I get it just right. This is one of those recipes. It’s been awesome since the very first time I made it, but I’ve been working to create a healthier version while still keeping it absolutely delicious. And you know what? This final recipe, which uses plain yogurt and very little oil happened to be better than all of the others. The flavors of the whole ingredients (especially the apples and bananas) are more apparent and it’s the moistest (ewwwwwww hate.that.word) banana bread I’ve ever sunk my teeth into. Naming this light, yet hearty breakfasty bread was no easy task. 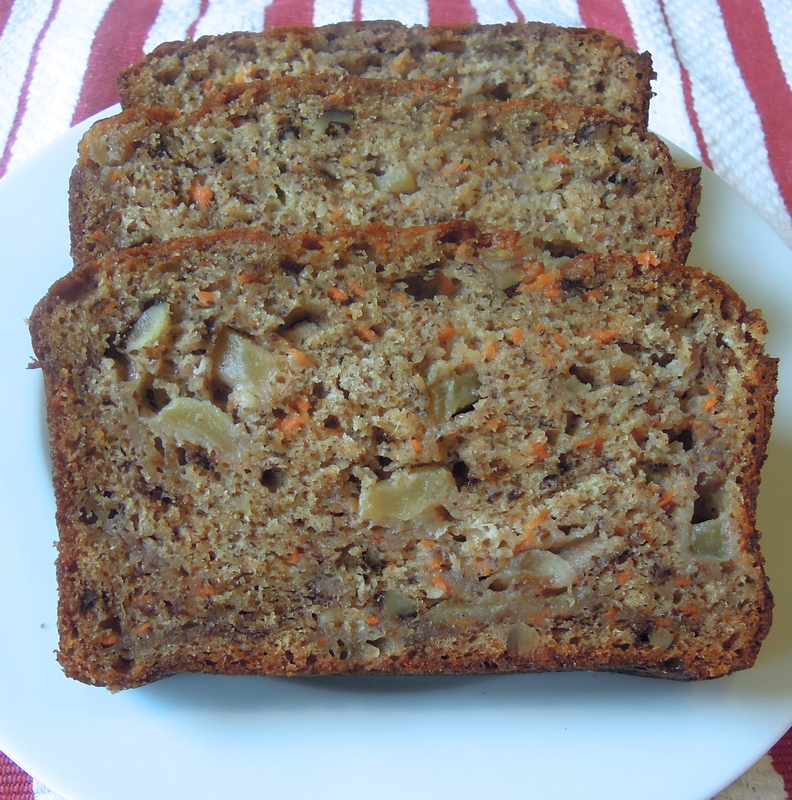 It’s made with whole wheat flour, apples, bananas, carrots – hence Whole Wheat ABC Bread. 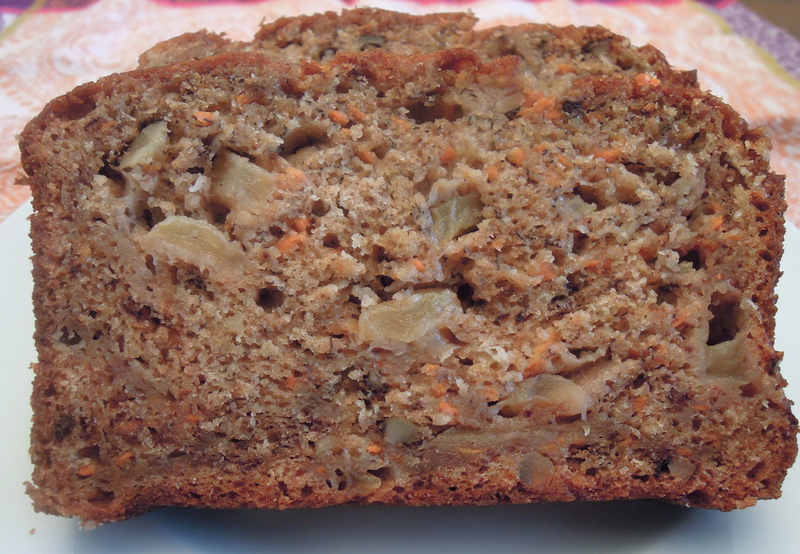 Another contender: 1-2-3 bread since it contains 1 apple, 2 carrots, and 3 mashed bananas. Whatever you like to call it, it’s quickly becoming this year’s version of my apple cake since I’ve been making it nearly every week. Now that I’ve nailed down a recipe that delivers the healthiest and the yummiest results there’s no signs of stopping now! In the bowl of an electric mixer fitted with the paddle attachment or using a hand-held mixer, mash the bananas. Add the sugar, canola oil, yogurt, eggs, and grated carrots. Mix to combine. Remove bowl from electric mixer. In a separate bowl, combine the all-purpose flour, whole-wheat flour, baking soda, salt, cinnamon, and nutmeg. Whisk to combine. Add dry ingredients to wet ingredients and mix with a spoon or spatula until combined. Add chopped apple and chopped walnuts. Mix until distributed evenly throughout. Spray a loaf pan with cooking spray. Add batter. Bake 65-75 minutes until a tester comes out clean. Let cool in pan for about 10 minutes before turning out onto a cooling rack. This entry was posted in Baked goods, Breakfast on October 31, 2013 by Paige Greenfield. Happy Friday friends. We made it! Robert and I are flying to Kansas City tomorrow morning to celebrate our final wedding of 2013. 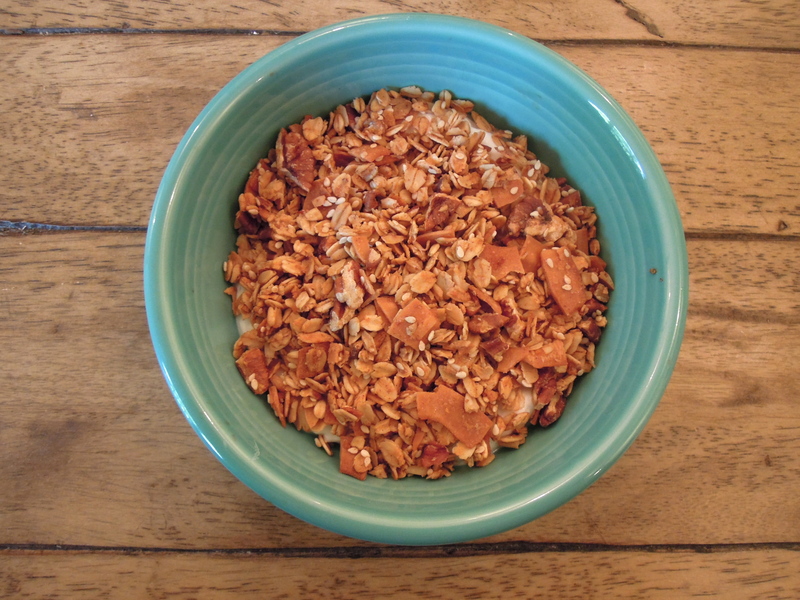 But first, I wanted to leave you with this recipe in case you plan to spend some time in your kitchen this weekend: Maple walnut granola. It’s my absolute favorite this time of year. I make one to two batches each week and eat it every single morning for breakfast. I add it on top of plain Greek yogurt with some sliced strawberries. I’ve also been known to pour some in a little bowl and snack on it for dessert. 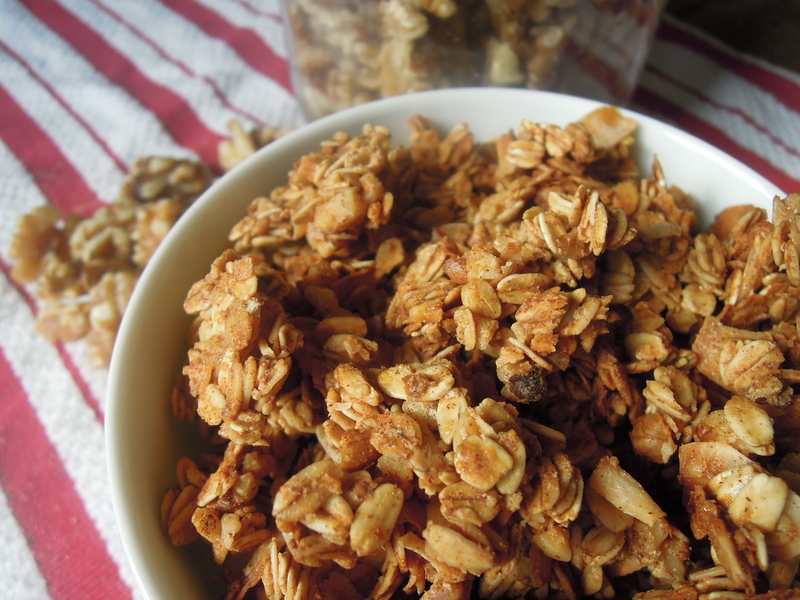 Sure, you could easily buy granola in the store, but this is so simple to make and so worth it. All of the sweetness comes from the natural sugars in maple syrup (just 1/2 cup for the whole thing) and you get healthy, filling fats from olive oil and lots of chopped walnuts. There’s also a generous sprinkling of cinnamon and a hit of nutmeg that makes it totally season-appropriate. A generous bowl of this stuff can keep me full from about 8am to 1pm. After some trail and error, I finally discovered the secret to getting those big clumps of granola. When you pull the granola out of the oven, let it sit on the baking sheet without touching it until it’s cooled — about 20 to 30 minutes. You’ll get those giant mounds that make it difficult to put away before you’ve munched on half the batch. In a big bowl, combine oats, coconut flakes, and walnuts. In a separate, smaller bowl add the olive oil and maple syrup (note: if you give the 1/2 cup measuring cup a quick spritz with cooking spray before adding the maple syrup it pours out much easier). Stir together the oil and maple syrup and pour on the oat mixture. Using a spatula, mix until oat mixture is totally coated. Add the cinnamon, nutmeg, and salt, and mix again until everything is coated. Spread it onto a parchment-lined baking sheet. Bake (no need to stir) for 50-60 minutes until evenly browned. Remove from oven and let cool completely, about 20-30 minutes, until cool and dry to the touch before breaking up with your hands or a spatula. Store in an airtight container. This entry was posted in Baked goods, Breakfast on October 25, 2013 by Paige Greenfield. First things first….a new blog design! It’s still super basic and will likely undergo several more changes, but the old one was so dark I really needed a change ASAP. As I mentioned earlier this year, I have some big plans in store for this little blog. More to come in the future, but for now it’s a little upgrade to make things lighter and brighter around here. There’s also an updated “About” section and an Instagram feed to the right. I feel better already! Now on to the really important stuff: I’m finally back with a recipe! Ohhhh and it’s a really good one, too. 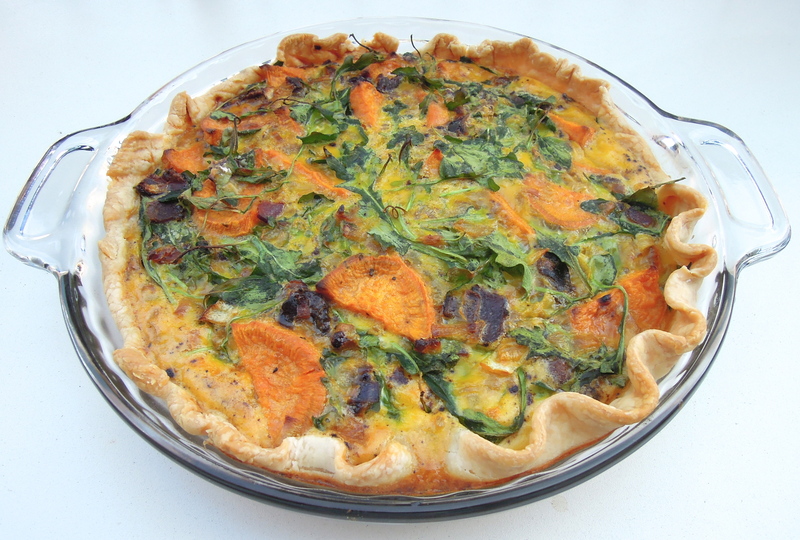 Sweet potato, arugula, bacon and caramelized onion quiche. All in a flaky (albeit store bought) crust. One day, I’ll venture into the world of homemade pie crust, but for now I was perfectly happy to reach into the fridge and unroll the prepared piece of dough. I combined two awesome recipes from two of my favorite blogs–this frittata from Big Girls Small Kitchen and this quiche from Gimme Some Oven. What I loved, too, were the instructions for cooking the sweet potato and caramelized onion the night before from the BGSK recipe–it’s not necessary, but I had the time Friday evening and it made a big difference Saturday morning. By the way, if you’re not feeling like spending an hour caramelizing onions it’s totally cool. In the instructions below I offer a delicious time-saving alternative. It was a perfect weekend breakfast that totally captured the flavors of fall. I served it with a frothy homemade latte (thanks to my new Nespresso machine that I’m totally in love with) and a sliced Michigan green apple. It was exactly the boost I needed to dive into a lengthy weekend To-Do list. What’s not to love? For the onions, coat the bottom of a big pan with olive oil and heat over medium heat. Add the onions and cook until they start to soften. Give them a stir so they’re evenly spread across the pan. Turn the heat to low and allow the onions to cook, untouched, for 10 minutes. Stir and allow them to cook again, untouched, for 10 minutes more. Continue with these 10 minute increments until they’ve cooked about 40-50 minutes and are browned. Sprinkle with salt. Either set aside or, if making ahead, allow onions to cool to room temperature and store in an airtight container in the fridge. Note: If you don’t have time to caramelize the onion, see note below. While the onions cook, roast the sweet potato. Preheat oven to 400. Peel potato and cut in half. Then cut into 1/2-inch thick pieces. Toss in a bowl with some olive oil, salt, and pepper. Arrange in a single layer on a baking sheet and roast 25-30 minutes until they just start to brown. Either set aside or, if making ahead, allow potato to cool to room temperature and store in an airtight container in the fridge. When ready to make the quiche, preheat oven to 350. Place pie crust in an ungreased pie plate. Bake for 8 minutes. Set aside. Cook bacon in a pan until crispy. Remove to a paper towel-lined plate. Note: if not caramelizing the onion, saute chopped onion in some of the bacon drippings until softened, about 10 minutes. In a bowl, whisk together the eggs. Add the milk, flour, baking powder, and some salt and pepper and whisk to combine. Stir in onions, sweet potato, and arugula. Crumble bacon into pieces and add to bowl. Stir until combined. Pour quiche filling into crust. Bake 45-55 minutes until a tester comes out clean. 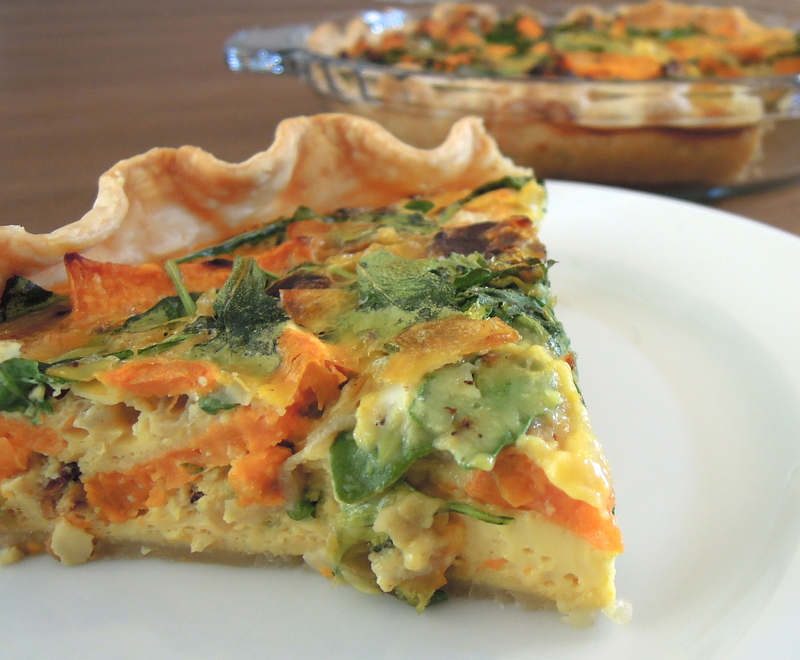 Allow quiche to rest for 5-10 minutes before slicing and serving. This entry was posted in Breakfast on October 15, 2013 by Paige Greenfield. 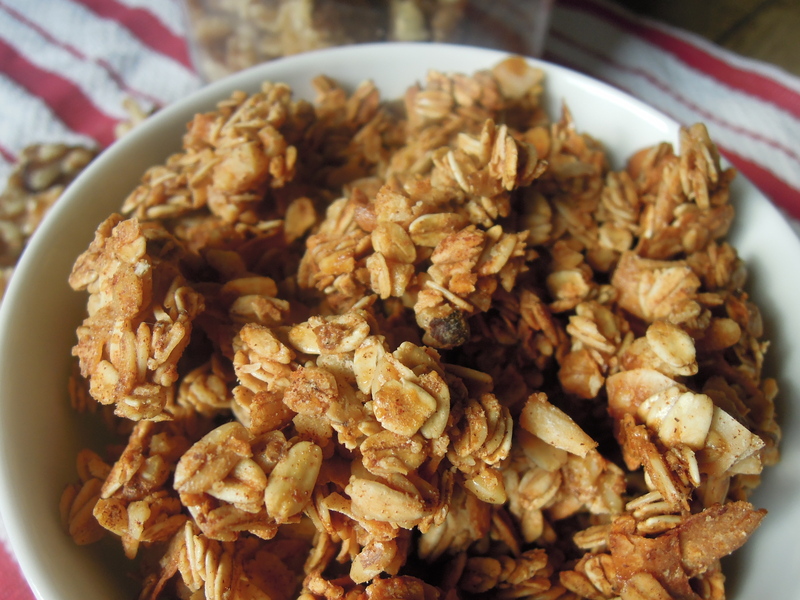 I have always loved granola (sweet clusters of goodness, what’s not to love? ), but this recipe has taken things to a whole new level. Obsessed may be more like it. Last week Robert and I flew to the east coat to celebrate my PopPop’s 85th birthday in Ocean City, Maryland where Robert met a few dozen family members for the first time. It was so fun and so special. (I think I owe him a diagram so he can see how everyone’s related!) We then spent a few days in New York City with my family and I even had a chance to show him around my hometown on Long Island. While staying with my parents, I finally got to try the homemade granola my mom’s been raving about for a while now. And she was right – it was insane! The best way I can describe it is light, crunchy, with just the right amount of sweetness. I didn’t realize it until I tried her’s, but so many times granola can feel heavy. Not this stuff! The batch my mom made had dried blueberries as well as chopped almonds and walnuts. When I got back to Chicago I knew I had to make a batch of my own ASAP. When I looked at the recipe I realized I could use coconut oil instead of olive oil. I hadn’t used coconut oil since I made this recipe so I figured it was a great opportunity to see what else it could do. 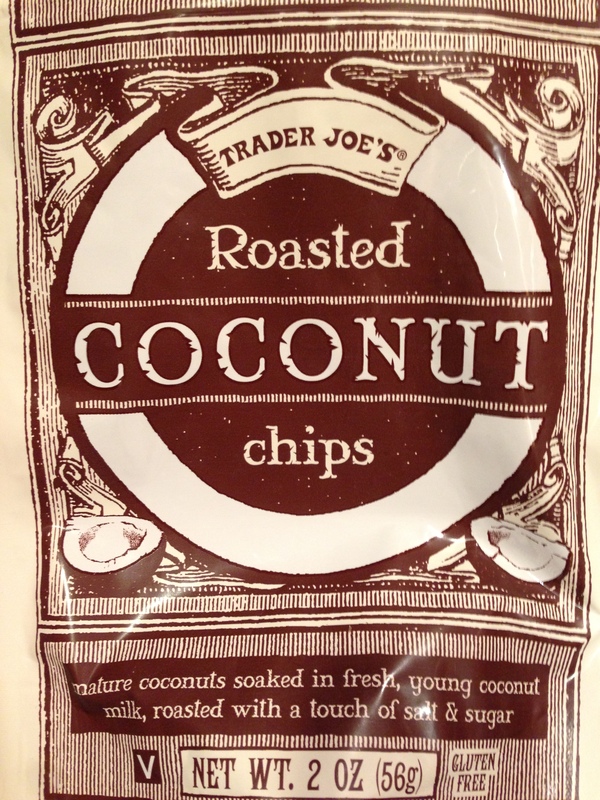 I also found these roasted coconut chips at Trader Joe’s, which provided the perfect crunchy addition. You could easily add some dried fruit, too, but my favorite way to eat granola is over plain non-fat greek yogurt with fresh sliced strawberries. Yum! Preheat oven to 300 degrees. Combine all ingredients in a bowl and toss to combine. Pour onto a parchment-lined baking sheet. Bake about 50 minutes, stirring once or twice while baking. Let cook on baking sheet. This entry was posted in Breakfast on May 13, 2013 by Paige Greenfield.